NAEP test scores for 2015 are in—and they're not great. 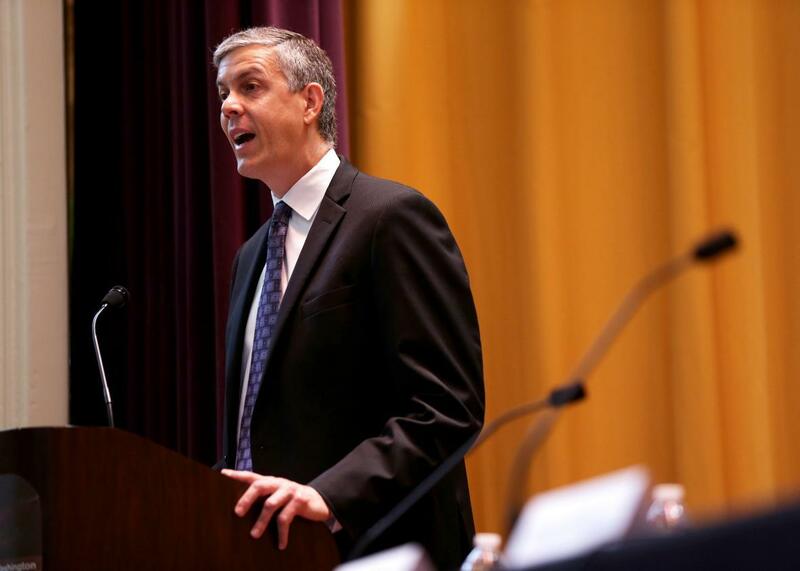 U.S. Education Secretary Arne Duncan tried to put a positive spin on the first-ever decline in NAEP math scores. The NAEP, or National Assessment of Educational Progress, scores are out Wednesday, and the results are not heartening. For the first time since the Department of Education began administering the NAEP tests in 1990, math scores in fourth and eighth grades dropped. The carefully culled sampling of students in 50 states and 20 urban areas performed no better on the reading component, with scores flat in fourth grade and two points lower in eighth grade. Designed as a “common metric for all states and selected urban districts,” the NAEP is given to students all over the country across all demographic groups. Because it’s administered to so many different students in so many different places, and because its content has remained fairly consistent, the NAEP—which is also called the “Nation’s Report Card”—is considered an invaluable yardstick for gauging student achievement over the decades. Unlike most standardized tests, the NAEP assessments are generally quick, completed in about an hour, impossible to game, and reported anonymously, so they’re completely without stakes. The fraction of students who take the assessments don’t even find out they’ve been selected until shortly before the test gets underway. The declines this year are incremental, sure—the dip in math scores in fourth and eighth grades were one and two points, respectively—but so, too, were past gains: In the 25 years since the NAEP has been administered, math scores have inched up a total of 27 points, or roughly 1 point a year, in fourth grade, and 20 points in eighth. Reading scores have been harder to budge, with a net increase of six points in fourth grade and five points in eighth since the first assessment in 1992. Time—and lots, lots more tests—will tell. *Correction, Oct. 28, 2015: This post originally misidentified the National Assessment of Educational Progress as the National Assessment of Education Progress.